The nominating deadline is Saturday, May 6, 2017 at midnight EDT. Read "Songbun", and if you like it, please nominate it. 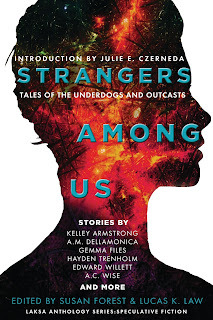 "Songbun" was published in the anthology Strangers Among Us: Tales of the Underdogs and Outcasts, edited by Susan Forest and Lucas K. Law, from Laksa Media Groups Inc.
During the nomination period, "Songbun" will be available free on my website at http://www.derwinmaksf.com/Songbun.html or you can download a pdf here. The Canadian Science Fiction and Fantasy Association (CSFFA) charges an annual $10 membership fee, so both new and returning members will be asked to pay $10 by Paypal. Renewing members can access the membership portal and make nominations after paying the membership fee. New members will receive a Society number by email and can go back to the Aurora Awards website and submit nominations. Nominees do not get any sort of monetary gain from the fees. The CSFFA is a non-profit organization, and its small budget, raised by the membership and voting fees, goes to administer the awards program and produce the trophies. $10 is a low price to promote national pride in our science fiction and to give a small reward to your favourite authors, artists, and fan organizers. The online nomination deadline is May 6, 2017.